North Korean leader Kim Jong-un has renewed his commitment to making the Korean Peninsula free of nuclear weapons and threats in his meeting Wednesday with a South Korean delegation that visited Pyongyang to arrange a third inter-Korean summit for this year, according to the North's state-run media. Kim also discussed "candidly" with the delegation issues related to improving relations between the two Koreas and ensuring lasting peace and stability on the peninsula, the Korean Central News Agency said Thursday. "Noting that it is our fixed stand and his will to completely remove the danger of armed conflict and horror of war from the Korean peninsula and turn it into the cradle of peace without nuclear weapons and free from nuclear threat, he said that the north and the south should further their efforts to realize the denuclearization of the Korean peninsula," the KCNA said. "He also talked with it candidly over many issues arising in accelerating the development of the north-south relations and preserving peace and stability of the Korean peninsula," it added. The KCNA said that Kim and the South Korean officials exchanged views on the schedule for what will be the third summit between its leader and South Korean President Moon Jae-in this month, though it did not disclose a specific date. Later, Cheong Wa Dae of South Korea said that Moon will travel to Pyongyang from Sept. 18-20 to meet with Kim. The delegation's trip to the North comes amid growing concerns over a stalemate in denuclearization talks between Pyongyang and Washington. US President Donald Trump canceled a planned North Korea trip by his Secretary of State Mike Pompeo last month, citing a lack of progress in nuclear talks. The stalled denuclearization negotiations have apparently taken a toll on Seoul's efforts to advance inter-Korean relations on various fronts, as Washington remains firm on maintaining sanctions until the North takes substantive steps to abandon its nuclear weapons. The North has complained about slower-than-expected progress in inter-Korean relations. The two Koreas earlier agreed to hold the third Moon-Kim summit meeting in Pyongyang in September but did not finalize the date for the third meeting between the leaders following one in April and another in May. The delegation conveyed Moon's letter to the North Korean leader during the Wednesday trip, which included a dinner reception hosted by the North. "After reading the personal letter the Supreme Leader expressed his thanks to the President for sending the good personal letter which expressed a firm will to wisely overcome many challenges in the future, too, and open a bright future of our nation while appreciating the fresh advance in the relations between the north and the south," the KCNA said. 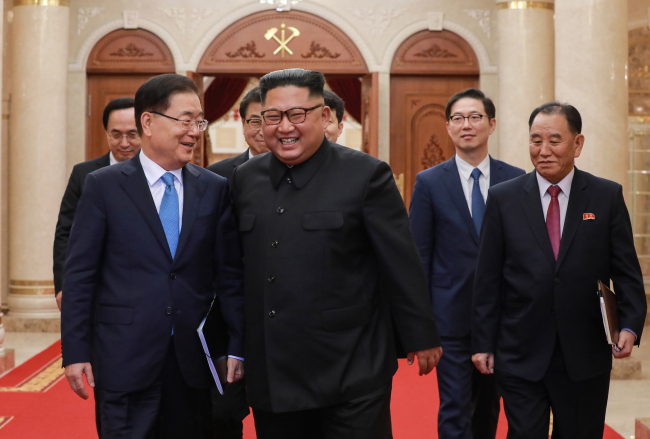 It added that Kim was "pleased" with the diverse cross-border contacts and projects, including recent reunions of families separated by the 1950-53 Korean War, military talks, and ongoing efforts to open a joint liaison office, calling them "successes" in inter-Korean relations. "We should value all these successes which the north and the south made hand in hand and keep advancing without deviation the north-south ties that have definitely entered the new orbit of peace, the orbit of reconciliation and cooperation," the KCNA quoted Kim as saying.